Only ALL-AMERICAN Pressure Canner/Cookers feature an exclusive, precision machined “metal-to-metal” sealing system. Positive action clamping locks to align the cover to the base, forming a steam-tight seal. Since the seal does not use a gasket, the cover can be easily opened and closed. ALL-AMERICAN Pressure Canner/Cookers make it easy to can fish, meat, vegetables and fruits – it’s the only method the USDA recommends for low-acid foods. All models feature a readable pressure gauge for accurate pressure control and an easy-to-read, 8.5 x 11″ Instruction and Recipe Book. **We do not recommend cooking beans, lentils, etc. in our pressure cooker. **ALL-AMERICAN Pressure Cooker/Canners are NOT suitable for glass/flat top ranges and are for home use only. 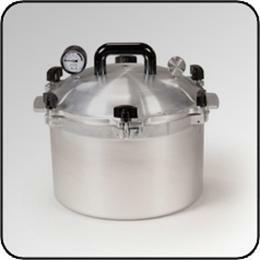 ***The 30 Qt All-American Pressure Canner Model 930 is NOT suitable for canning smoked fish. ***This product is proudly designed and manufactured in the USA! ***Please Note: Number of jars are approximate and will vary with the jar brand and style. The All-American Pressure Canner/Cooker Model 930 can be used as a Pressure Canner for processing canned food items as well as a Pressure Cooker for preparing and cooking every day meals. 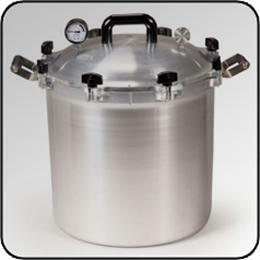 Be the first to review “All-American Pressure Canner Model #930” Click here to cancel reply.